In our latest ‘Spotlight On’ feature, Leanne English chats to John Holmes, owner of surface repair and protection specialist Reprotec, about the company’s 30 years in business and its journey to position itself as a national award-winning company, passionate about investing in its staff. 2018 is Reprotec’s 30th birthday. Tell us a little bit about the history of the company. 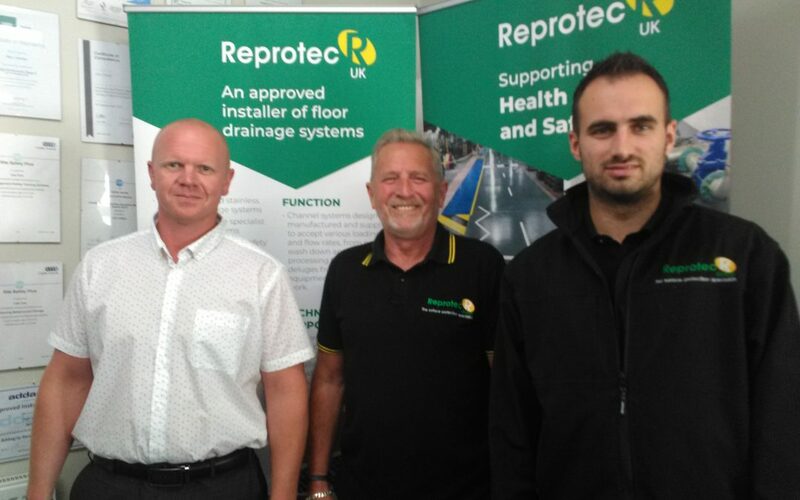 Reprotec started as a surface engineering sales agency, but we soon moved into high end technical engineering processes and products including resin repair and maintenance. We then established ourselves as a distributor of these products, supplying to the heavy industries like ship building and mining. At the same time, we were being asked if we could also paint floors and repair roofs, so we branched out. We grew very quickly and were doing well, but after around 15 years we needed to reassess our aims and goals. In around 2006 you decided to radicalise training within the industry. How did that come about? Yes, we did. We decided to really embrace training and investment in our workforce, to ensure that our turnover of staff was minimal. In 2007 , five employees completed an NVQ Level 2 in Resin Flooring, they were five of nineteen nationally to gain the first ever industry qualification as part of commitment to our long-term growth and their personal progression, and I’m delighted to say all five are still with us today. Back then our industry was very much without profession, so we were instrumental in changing that and helped introduce qualifications like an NVQ in management training and also apprenticeships. For our efforts we were awarded ‘Investors in People’ status and won a national training award which was fantastic for everyone associated with Reprotec. It’s fair to say Reprotec is a ‘green’ company isn’t it? We are very passionate about our green credentials and won another national award for becoming one of the first companies within the industry to divert 100 per cent of waste away from landfill. We’ve also recently launched a new ‘green’ programme, which will ensure we’re operating as efficiently, innovatively and environmental friendly as possible. Today the company is regarded as a leading surface repair and protection company – a one-stop shop for the industry. As our name suggests (Reprotec stands for Repair Protection Technology), we repair and maintain internal and external surfaces including steel and concrete structures. The business is very much established and respected. We work across all industry sectors and count some of the leading names within the regional automotive, engineering, processing and manufacturing industries among our clients, as well as the likes of Northumbrian Water, 3M and Walkers Pepsico. We now employ 19 people, one of whom has gone right through the qualification stages to NVQ Level 6 in Contract Management, which is degree level; and the good thing is, our people stay with us. We pride ourselves on being a company that our current and future employees want to work for, and our investment in staff has certainly helped our turnover grow which is now around £1.5m. We are also in the process of launching a joint venture which will see our e-commerce business roll out nationally. What does the future hold for Reprotec? Our aim is to continue to grow although to be honest, I could do with being 20 years younger! We’re also very keen to raise our profile within the engineering and manufacturing networks too, which is why we’ve joined the CDEMN network. For all we’re 30 years old there are still people who don’t know who we are and what we do, and that’s something we want to change.